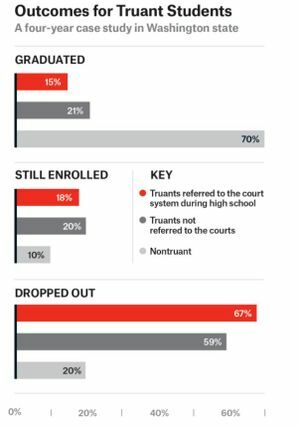 Data now backs what common sense suggests: Kids who are chronically truant don't change their ways when the courts get involved. In fact, they do worse. In hindsight, it seems obvious: Sending a kid to court because he hates going to school will hardly change his mind. Like suspensions — now being widely re-evaluated as a go-to punishment — the main outcome of truancy laws appears to be pushing less-engaged students even further away. In Pennsylvania, more than 1,600 parents have been jailed since 2000 for failure to pay truancy fines. In Atlanta, parents can be imprisoned for 60 days if their kids are picked up outside of school during weekdays. In Jacksonville, Fla., 44 warrants were issued for the parents of truant children last fall. And in Texas, where “failure to attend school” is a Class C misdemeanor, 70,000 kids faced such charges last year. “A child going without education is tantamount to a crime,” Kamala Harris, state Attorney General in California, told The New Republic. In California, parents can get fines up to $2,500 or a year in jail if their kids are truant. While that penalty is relatively rare, more than 1,000 truant kids end up in foster care, group homes or juvenile detention for nothing more than absences from school, the New Republic reports. Another 15,000 truants get probation, meaning that a violation like breaking curfew could lead to lock-up — as in a court record. Does this make sense? Local results suggest not. Data from a 2011 Washington State Center for Court Research report shows the results of a study based on four years of truancy petitions in Washington. Graphic by The New Republic. In 2000, a study of Seattle Public Schools found that filing truancy actions had no effect on whether students remained in school. A decade later, another Washington study found that truants sent to court were more likely to experience academic failure and to commit future crimes when compared with other chronically absent students who escaped court involvement. And in 2011, the Washington State Center for Court Research crunched numbers with similar results: Court-involved truants continued to cut school. They also got worse grades and were more likely to drop out. As with student discipline, a mountain of research suggests there must be better ways.